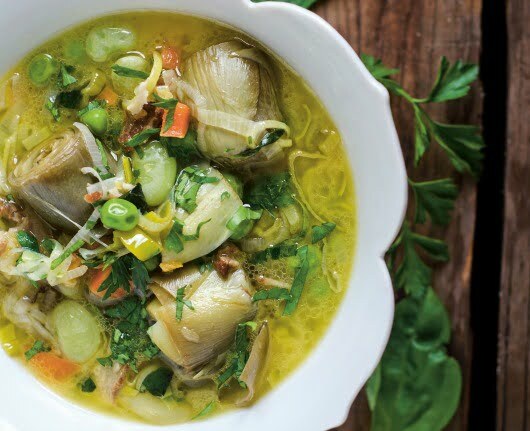 The Spring Vegetable Stew recipe below is from The Nourished Kitchen: Farm-to-Table Recipes for the Traditional Foods Lifestyle Featuring Bone Broths, Fermented Vegetables, Grass-Fed Meats, Wholesome Fats, Raw Dairy, and Kombuchas, a cookbook by Jennifer McGruther. After a long winter of heavy dishes—meats, potatoes, root vegetables, and breads—I look forward to the clean and vibrant abundance of spring. I make this Spring Vegetable Stew with the many firsts that spring brings: the first leeks, beans, peas, and artichokes. They stew together in Chicken Foot Broth, which offers up its delicate but still rich flavor as a companion to the vegetables. At the end, I toss in fresh basil, parsley, and mint, which brighten the stew a bit more with their clean and faintly floral notes. 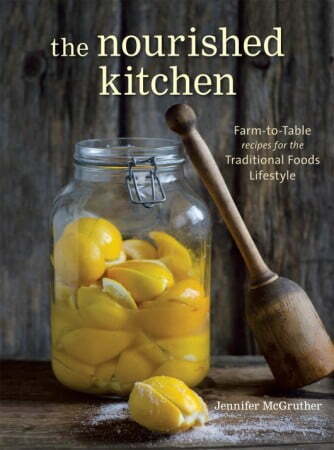 Lemon juice and zest add a punch of sourness that further complements the flavors of the stew. Warm the lard and olive oil in a heavy stockpot over medium heat. When the lard melts, stir in the leek and lemon zest and fry until they release their perfume and the leek softens, about 4 minutes. Stir in the carrots and fry, stirring from time to time, until crisp-tender, 5 to 7 minutes. Stir in the broth, lima beans, peas, and artichoke hearts. Cover and simmer until the vegetables become tender, about 30 minutes. Season to your liking with salt, stir in the herbs and lemon juice, and serve. Chicken feet are an extraordinary source of amino acids, particularly collagen, which is why chicken foot broth gels so readily. Its flavor is rich and concentrated, but somehow still delicate. Strain the broth, discarding the solids, then pour it into jars, cover, and store it in the refrigerator for up to 1 week or freeze it for up to 6 months. With chilling, the broth should gel enough that it must be scooped out of the jar with a spoon. This is normal, and the broth will liquefy once you heat it. A thin layer of yellow fat may harden on the surface of the gelled broth; I recommend discarding this fat, as it doesn’t lend itself to cooking. I now know how quick and simple pressure cooker broth is so I can make some mineral-rich broth more quickly in a pinch. I have to admit I’ve never made broth from feet, but if I had some I would. Thanks for posting, I shared this on my May real food meal plan. OOPS..forgot to say I have pre-ordered the book..very excited to get it!! This sounds YUMMY…I make Thai Chicken feet with lemongrass, coconut milk, and ginger simmered on the stove for an hour or two..OR the crock pot on low for 6 hours…HEAVEN on a bone!! !